The origin of the animé is based on a series of light novels that, my person guess being due to it's popularit, has 16 novels published so far. The animé only goes as far as volume 6, so breaking it down, about every 4 episodes take 1 novel to complete. The story of a guy who lives in a world of science, and science's prodigy development, Espers. Espers are people with special abilities based on scientific properties, and being able to manipulate them specifically through willpower alone. Ranked by Levels, Level 5 being the mighties, and Level 1 the weaker dozens. There's also Magic, and it's Magicians, who're pretty much waging war against each other. Kind of like how the US waged war with Russia a decade or two ago. Your average Esper. Except for the fact that he's Level 0. Other than that, a really great guy, always saving people, but more specifically girls from danger. He's got the ability to negate any type of Esper or Magic, thanks to his, "Imagine Breaker"!! Don't laugh too hard now. A chibi nun/priestess. She's got the best memory in the universe, being able to memorize everything from, oh, say all the leaves in a forest, to, oh, the shape of every raindrop, to, hm, 103,000 magic books. Y'know, the neccessary stuff! Too bad she can't use magic herself. Ah, yes, the show's tsundere. A Level 5 Esper with the ability of the Railgun. So popular, she's taken over the entire 2nd season!! RAAH!! She participated in a experiment which allowed her to have 20,000 sisters. Twins...triplets...Is there a word out there, for 20,000 sisters? The strongest Level 5 Esper in Academy City. He has the ability to manipulate vectors. Sure it sounds lame, but think of the possibilities! So, you punch him? You connect with steel. You shoot him? You may see a bullet bounce right back. He's skinny cause he never needs to physically push himself, his hair's white cause his body doesn't need pigments to defect UV rays, and he's sadistic cause, well, that's what you are when you kill over 10,000 little girls. This guys still cool, though. The 'Last Order' of the 20,000 sisters, she's number 20,001 and follows around Accelerator for lols. Well, viewer lols at least. She really only appears for 2 episodes, but alot can happen in only 2 episodes. The hottie 'onee-chan', a magician with the power of, well, swinging a 2 meter long sword and a VERY striking body! A quite, yet beautiful gal who's code name is 'Deep Blood'. This code name is for the fact that she has the magical ability to attract and kill vampires. She seems like the most level-headed, but where's the fun in that? This little, little girl is actually an adult teacher in Academy City. She seems very childish, yet visiting her house, there are nothing but beer can and tens on dozens on cigarettes lying around. And if I haven't included anyone else, well, think about why I didn't mention Stiyl much. Well, this series started off decent, got better and better, and then--finished. I enjoyed the ride, though it never thrilled me, but it's definitely something to consider watching, cause of all them mumbo-jumbo big words! But honestly though, I love how they take every ability (at least the Epsers) and break it down scientiically. And they even take Magic and break it down rationally! 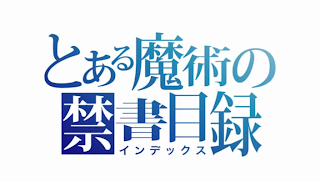 As expected of an animé based on a light novel: a real story with developed characters!